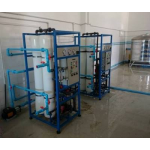 The three predominate membranes used in industry are Reverse Osmosis (RO), Ultrafiltration (UF), Microfiltration (MF). In certain specialised cases Nanofiltration (NF) is used. The pore size on microfiltration membrane ranges from 0.1 - 5 um, and has the largest pore size of the four main membrane types. Its pores are large enough to filter out such things as bacteria, blood cells, flour, talc and many other kinds of fine dust in solution. Because its pores are relatively large compared to other membranes, it can be operated under low pressures and therefore low energy. Ultrafiltration has a pore size range of 0.1 um to 0.01 um. UF membranes reject particles such as silica, viruses, endotoxins, poteins, plastics and smog/fumes such as ZnO. Due to the decrease in pore size, the osmotic pressure required is higher than that of MF. Nanofiltration has a pore size range of 0.001 - 0.01 um. NF membranes can filter particles up to and including some salts, synthetic dies and sugars, however it is unable to remove most aqueous slats and metallic ions, as such, NF is generally confined to specialis uses. Reverse Osmosis has a pore size range of 0.0001 - 0.001 um. It is by far the finest separation material available to industry. It is used on a large scale for the desalination and purification of water as it filters out everything but water molecules, with pore sizes approcahing the radius of some atoms in many cases. This pore size means it is the only membrane that can reliably filter out salt and metallix ions from water. The small pore size of RO membranes means that a significant amount of osmotic pressure is required to force filtration. 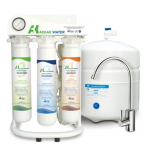 Home Drinking Water System that uses the principle of reverse osmosis to remove 95 - 99% of all the mineral and chemical contaminants from raw tap water. RO PURIFIER gives you the qaulity of bottled water with the convenience of a faucet mounted on your kitchen sink. 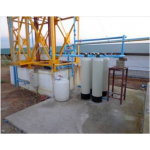 Media Filtration System is the most effective method for removal of suspended organic and inorganic solids from water such as suspended solids, odor, color, residual chlorine, macro organic molecules and ion to provide the clean water for multi purpose using. 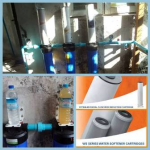 Fine Filter Filtration is a process of removing large particles, odor and color in the water by forcing the water through sediment and carbon filters.